Over 200 world-renowned presenters will bring their expertise, dedication, passion and enthusiasm to their sessions at the upcoming 2015 IDEA World Fitness Convention™, July 15–19 in Los Angeles. These well-respected experts are constantly giving out tips and inspiring us to live better and be more successful. We asked some of this year’s most influential and motivating IDEA World presenters to share the single piece of advice they would give another fitness/health pro to help him or her live a successful and happy life. 1. 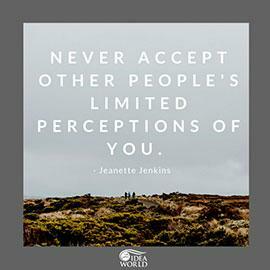 "Never accept other people's limited perceptions of you. Define yourself. You can do anything." 2. "Don't make it all about you. Inspire, motivate and support those around you!" 3. "Decide what you want in your life and career, take action every day to get closer to what you want, and hire a coach who's where you want to be to help you get there faster." —Rachel Cosgrove, Owner, Results Fitness and Results Fitness University Inc.
4. "Never tire of showing your compassion for people who need your gifts; meet people where they are and help bring them forward in a loving way. You will have more opportunities than you can handle if you start all endeavors with a love for lifting others up!" —Leslie Sansone, President, Walk Productions Inc.
5. "Move against your fear! I think a lot of people, myself included, become paralyzed when it comes to taking risks or trying something new to advance their professional careers. For example, we will hesitate or get stuck launching a new program or concept, or even going after new clients because we are worried that someone else is doing something similar or that we might be told no. Don't let your fears hold you back from following your passion. Relentlessly pursue what you believe is your purpose, and greatness will come." 6. "Always know your WHY— your purpose, your cause, your belief. This will guide you and inspire you for years to come." 7. "Strive to find more work–play (life) balance. The negative impact of stress on our lives is often ignored and undervalued. It can unravel everything you work so hard to achieve." 8. "Stay curious about your clients, your profession and yourself." 9. "Discover your WHY. Why did you choose to work in fitness? Why not some other field? Why are you willing to work long, odd hours to help others look and feel their best? Getting clear on why you're in this field is, maybe, the most important career move you can make. Once you discover your WHY, you can get crystal-clear on everything you should be doing to be happy, to move your career forward, and to be in alignment with your goals, your purpose and your passion. It's the one piece of information that makes a thousand decisions for you in advance. It becomes your compass for whether to take this opportunity or that one. It allows you to remain true to the reason you started in fitness in the first place, no matter how confusing or complicated or overwhelming things may get." 10. "Choose your lane! Pick one thing you really love and become an expert at it." 11. "Mastery Inspires Others! Don't try to specialize in too many things. Pick one or two things that you can master and aim to be the best. Others are inspired by mastery!" 12. "Put your oxygen mask on first. Take the time to do the things that make you happy, healthy and fulfilled so that you can then build others up from that place." 13. "The best way to serve others is to challenge and expand your mind, body and soul every day." 14. "Keep learning and growing. The fitness industry is always changing; to stay motivated and current, you need to keep learning." —Keli Roberts, Personal Trainer and Group Fitness Instructor / Owner of Keli's Real Fitness Inc.
15. "There's always more than one path to career happiness and success." 16. "Focus on serving. Contribute and donate to our global community, and consider doing so in anonymity. Life does not have to play out on social media. Try hard. Never quit. Make a difference." 17. "Be the most positive person you know and then spread that attitude and energy to everyone you touch. It makes all the difference in the world." 18. "Work on your business as much as your fitness. Having a successful business allows you to sustain your passion. The balance of the two means freedom to have abundance, happiness and peace." 19. "Be authentic, laugh a lot, serve others and engage and work with people who challenge and inspire you." 20. "In my twenties I chased my body. In my thirties I chased my business. Now, in my forties, I finally get it and I'm just living life in the moment. Always remember your happiness is defined by you, not by your body, your business or your accomplishments." Join these presenters and over 200 more at the 2015 IDEA World Fitness Convention™. Will you be there? Let us know by leaving a comment!